Hey! 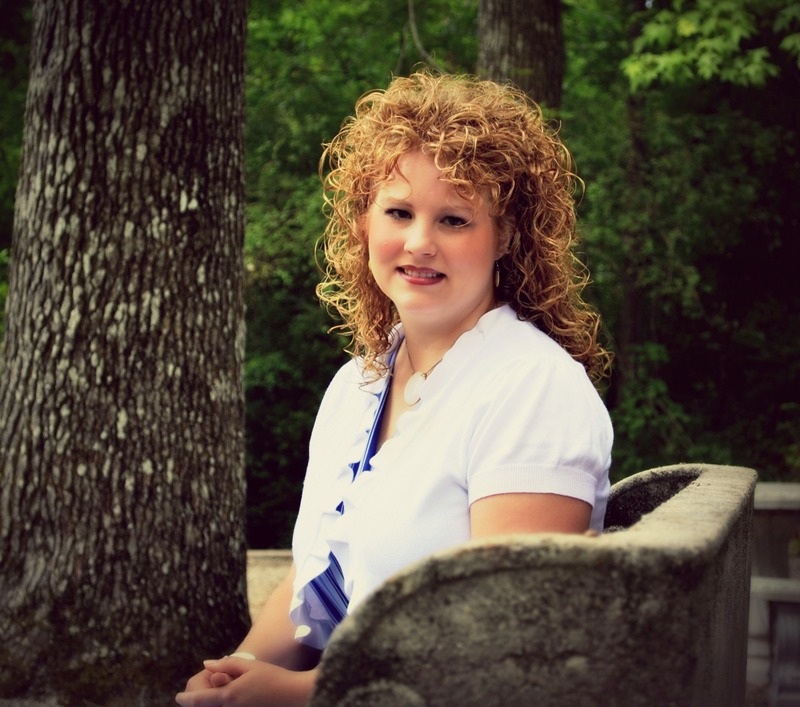 Did you miss me this week? Sorry, I have been a little absent. I have been trying to do a lot of work behind the scenes here on the blog and also trying to catch up on some projects. So I sort of took an unplanned break the first of this week. Can’t wait to share some new projects with you next week! But one thing I haven’t taken a break on is YARD SALING! This past weekend was gorgeous for shopping yard sales and my parking lot yard sale was PACKED! Everything was $1.00 and they were all brand new pieces. I have really fallen in love the last year or so with jewelry like this and I love having different colors that I can mix and match with different outfits. I don’t buy jewelry unless I get it for $1-2 at yard sales, thrift stores, or Cato so it makes it a very reasonable accessory. 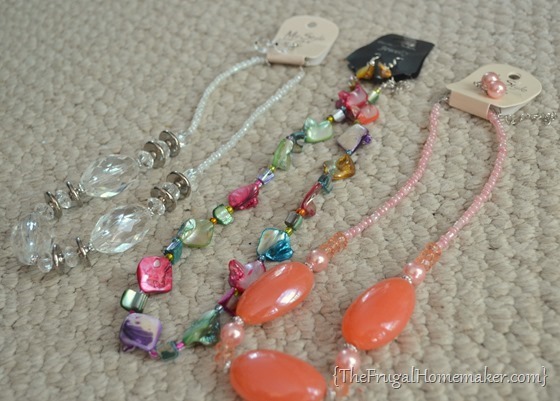 I loved that all the necklaces were SETS meaning they came with earrings too – great deal for $1.00! I LOVE longer pieces like this for some outfits and I only have 2-3 longer necklaces mostly in white, black or silver so I was excited to pick up some colored ones! 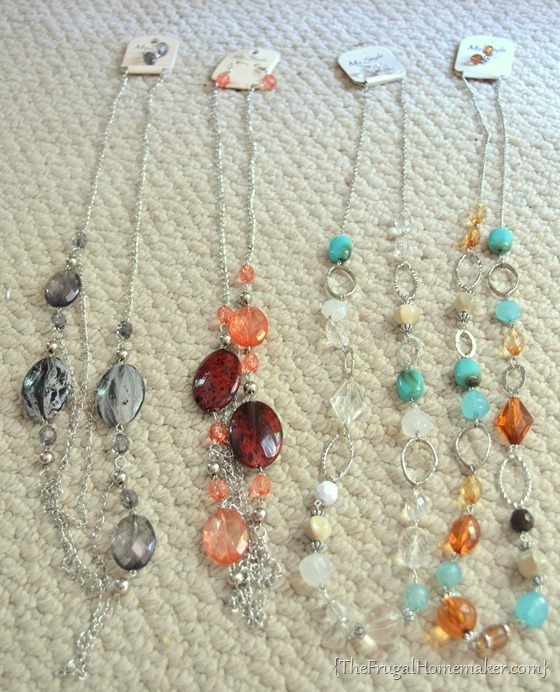 And these short necklaces too. I specifically was looking for that peach color so was excited when I found a necklace and a bracelet to match and a bonus set of earrings. So what did you find last week?? 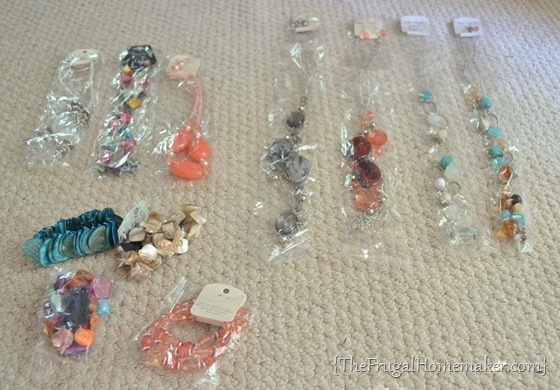 Ever bought jewelry at a yard sale? Would love for you to link up your finds below. Thought I might highlight some of the posts linked up last week! 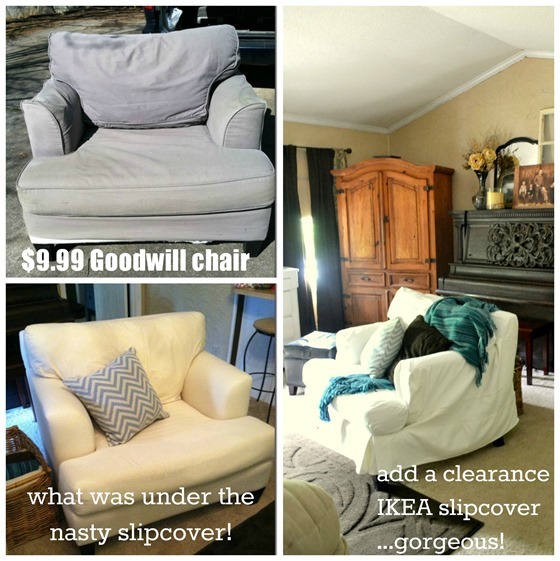 Molly from Pennies ‘n Grace found this $10 chair at Goodwill – nasty right?? But look what was under the slipcover! And when I house crashed her a few weeks ago we found a clearance IKEA slipcover to go on top of it. A chair like this (and the price!) are on my list too. Christa from Brown Sugar Toast picked up this shirt in a “fill a bag for $3” sale at a yard sale. It was a little big so she did a quick alteration to make it fit! Can’t beat her 30¢ shirt now! And Jae from Design OCD found this tray at Goodwill – but it wasn’t gold when she bought it. Read how she gold leafed it here. Loving those posts linked up and more – you can see all of them here. Come link up your yard sale, thrift store, flea market, or roadside rescue finds of the week. Also welcome – posts sharing how you transformed or decorated with a yard sale, thrift store, or roadside find. 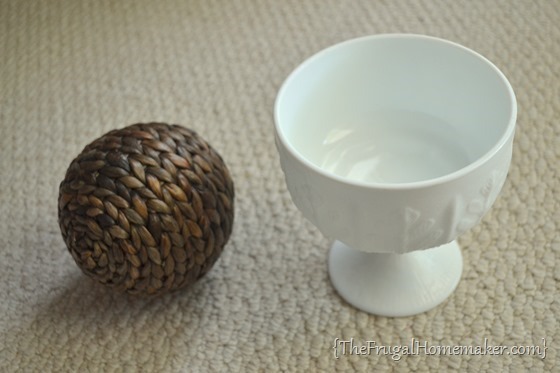 Love the jewelry, especially the brown/tourquoise piece, and the milk glass bowl! 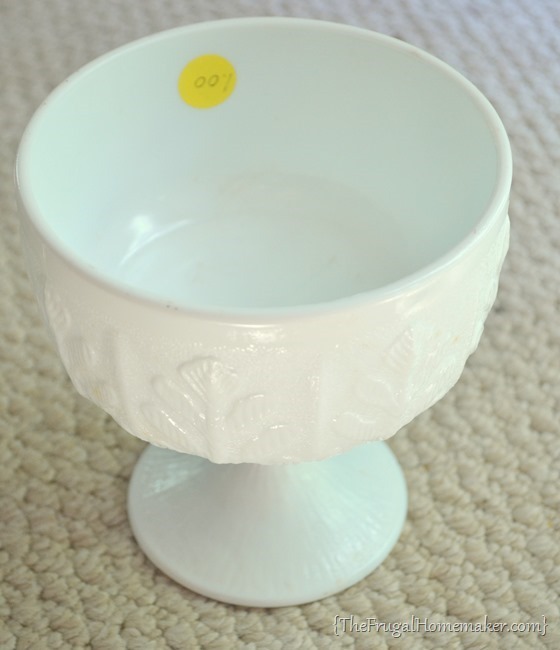 I haven’t purchased jewelry at thrift stores, yard sales or flea markets, but I have bought milk glass! Glad to have you back – missed you this week! Thanks for hosting the party! 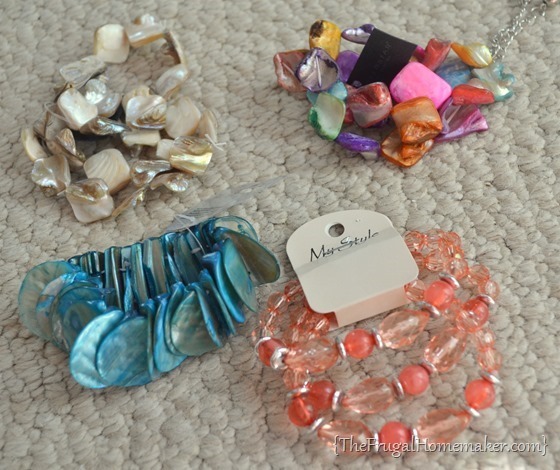 I have never bought jewelry at a yard sale, just because most of the stuff I see is not the best quality and too new to be vintage. But I would have jumped on those necklaces! love the rattan ball you found! and the jewelry!! what a steal!!! Thanks for hosting the party. Last year I found an IKEA Tullsta chair at goodwill for less than $20. It was a bit dirty but I cleaned it up and got a new slipcover at Ikea. It looks like a brand new chair.